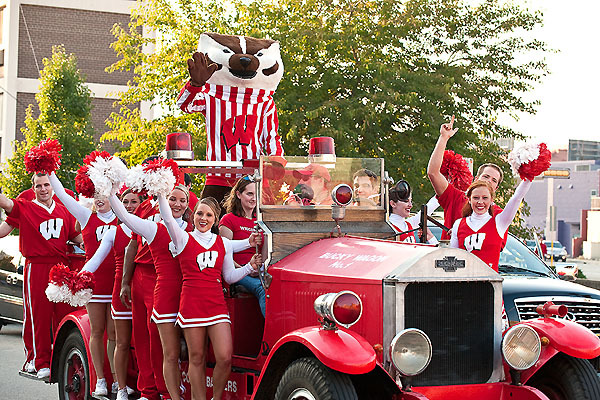 Here’s a slideshow of all the fun we had over the weekend showing off the Bucky Wagon to students and alumni in Madison for homecoming celebrations. A cracked transmission put the Bucky Wagon out of commission in the first place, so the installation of a new transmission and motor is a pretty monumental step in finishing the revamped wagon. Still, the assembly of the electric motor, donated by Remy International, and the transmission, from ZF Transmissions, seems somewhat unceremonious, partly because it’s the sort of thing that members of the vehicle team do all the time. Here you can see members of the vehicle teams goofing around near the new motor and transmission before they bolt them together using an adaptor system designed by other students in the program. The new engine won’t be under the hood, but instead beneath the body of the wagon. Now, the hood will house all the batteries necessary to keep the wagon running. The engine provides enough power to get the wagon up to around 30 mph. It’s not exactly a speed demon—but there’s more than enough oomph to ferry the Spirit Squad around in style on game day. From left to right: Formula SAE Team member Kevin Higgins, the electric motor donated by Remy International, and the transmission donated by ZF Transmissions. A closer look at the motor and the transmission, before they were bolted together using a student-designed adaptor system. Kevin and the other students work to use the adaptor system to connect the transmission and motor. The Bucky Wagon’s siren has been cleaned and polished to a new shine, but it’s still the same siren the wagon sounded in Camp Randall in 1973. Not only does it maintain the look of the wagon, the siren–along with the old headlights, which also are cleaned up originals–are some of the most valuable parts of the wagon, fetching several thousand dollars apiece when up for sale. 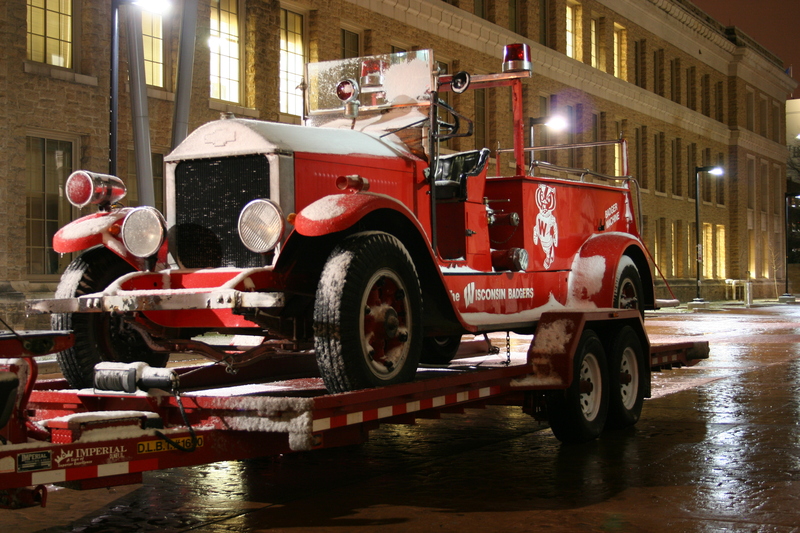 Unfortunately, engineers designing fire engines in the 1930s weren’t all that concerned about electricity use, so the siren is a huge power draw. If left unchecked, that power draw could spell trouble for an all-electric vehicle, so Bower and his team have worked around the siren’s limitations: A controller will prevent the siren from wailing for too long or too often, depending on battery levels. A few short bursts might be kind of a bummer—but that’s certainly better than forcing the Spirit Squad to push the Bucky Wagon the rest of the way to its destination. The siren has been cleaned up, but otherwise it will function the same as ever, flaws and all. Mascot Bucky Badger and cheerleaders from the UW Spirit Squad drive along Regent Street in the Bucky Wagon before the Wisconsin vs. Penn State University football game at Camp Randall Stadium at the University of Wisconsin-Madison on Oct. 11, 2008. Note the same siren on the hood. It’s been a few months since the last update on our intrepid Bucky Wagon. But trust us, that’s a good thing–the entire body has been disassembled to be primed and repainted a glorious Badger red. The frame has been rebuilt and powder-coated. New pieces of the wagon arrive in the garage every week, as Glenn Bower and his students work tirelessly getting the Bucky Wagon ready for its debut at this year’s homecoming. We’re going to be highlighting these pieces on the blog each week as the big day approaches. When the completed wagon finally comes together, expect a sneak peak at the big reveal. First up, we’re talking about power: the lithium-ion battery pack donated by A123 Systems—something that’s definitely new to the old fire engine. The huge battery array in the Bucky Wagon will be regulated by a controller that ensures the batteries are depleted evenly and at a safe temperature–warm so that the batteries provide the optimal electrical output, but not so hot as to give Bucky second-degree burns in his seat. The batteries provide enough juice to get the wagon up to a planned top speed of around 30 MPH. Check back for more updates on the engine, the new tires and more as the wagon comes together. Lithium-ion batteries that will power the all-electric Bucky Wagon. Team advisor Glenn Bower with the Bucky Wagon and its new axle from Ford Motor Co. This weekend is the much-anticipated Camp Randall Hockey Classic (the super-cool outdoor exhibition at Camp Randall). On Saturday, February 6, the Badger women’s team faces the Bemidji State Beavers at 2:00 and the men’s team takes on the Michigan Wolverines at 5:00. Before or in between games come by the south entrance of the Engineering Centers Building (1550 Engineering Drive) for hot chocolate served by members of the UW-Madison vehicle teams. Students will be serving from 1:00-5:00. The Bucky Wagon will be on site for its final public appearance until spring. After Saturday, the vehicle will be in the shop for the beginning of intense renovation efforts. When the Bucky Wagon emerges in May, it will have a new axle and motor, as well as a restored body. 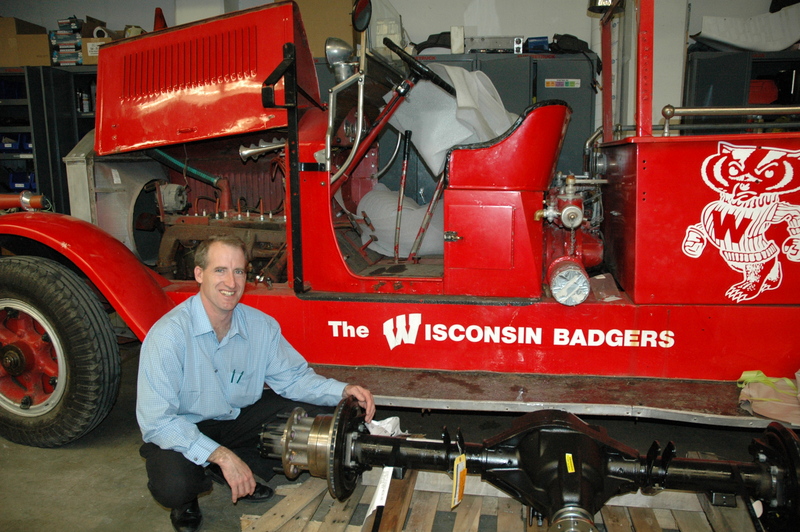 So come out Saturday and celebrate with the vehicle team–go Badgers and go Bucky Wagon! As winter weather sets in at full force–blizzard conditions are expected in Madison tonight and tomorrow–the vehicle team members are seeking a generous donor who can provide space for the Bucky Wagon through January. More details will be provided soon about the specific size of the Bucky Wagon and the dates it needs a home. If you think you may have an appropriate space for the vehicle, please contact Glenn Bower right away at: grbower @ facstaff.wisc.edu. The team sincerely appreciates the help in ensuring the Bucky Wagon is stored in a safe place this winter.